LORIENT, France — France’s Groupama completed a heroic comeback victory on Leg 8 of the Volvo Ocean Race June 15, strengthening its grip on the overall standings and realizing a dream homecoming to Lorient — while the crew of Spain’s Telefónica was left to reflect on what might have been, after a cruel twist of fate. Just two days earlier, Groupama was in fourth, with its crew struggling to catch up after spending more than two hours trying to free a jammed mainsail. Bowman Brad Marsh had to climb the 31-meter mast three times in storm conditions. But once again, the French crew led by skipper Franck Cammas showed off a blistering pace, hauling back their rivals to move into second going into the final 24 hours of Leg 8. And when Telefónica’s crew saw their hopes dashed by a second broken rudder 12 hours from the finish, Groupama was left unchallenged into Lorient. The win gave Groupama a maximum 30 points for a total of 219, bolstering the team’s position at the top of the overall leaderboard. Groupama couldn’t have picked a better place to notch up its second offshore leg win than its home port of Lorient — and, in return, an army of French fans turned out to give crewmembers a hero’s welcome. As Groupama reveled in its victory, Camper with Emirates Team New Zealand crossed the line to take second place and move into third overall. Puma Ocean Racing powered by Berg was third in Leg 8 and second overall, trailing Groupama by 23 points. Just one leg and two in-port races remain, with 42 maximum overall points available. A French team last won the Volvo Ocean Race — formerly called the Whitbread Round the World Race — in 1985-86, when Lionel Péan captured the overall trophy on-board L’Esprit d’Equipe.??? The heartbroken sailors aboard Telefónica saw their dreams of a fourth leg win evaporate overnight when, during the much-anticipated and much-feared gybe toward the finish in Lorient, Telefónica damaged its port rudder — before sunlight June 15. The damaged rudder forced the Spanish entry to drop its speed by more than half, to around 10 knots. 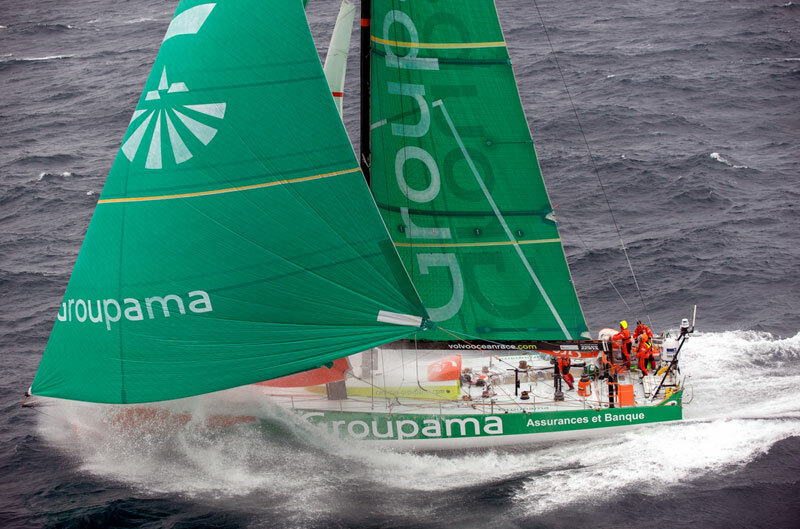 Groupama’s victory in Leg 8 all but mathematically ended Telefónica’s chances to become the first Spanish team ever to win the Volvo Ocean Race. As Telefónica limped slowly toward France, Groupama took the lead and recorded its second leg win of the 2011-12 race. The drama began 24 hours earlier for Telefónica. On Thursday afternoon, June 14, after fixing a broken starboard rudder, Telefónica regained the lead of Leg 8 from Lisbon to Lorient. As the expected wind shift arrived late in the evening, Telefónica was the first to gybe, followed by Groupama. Leading the fleet, and with less than 300 miles to Lorient, the Spanish boat landed awkwardly off a huge wave in a seething seaway and suffered damage to the port rudder, as well as a breakage in the spare starboard rudder fitted as a replacement on June 14. Fortunately for the team, the single effective rudder was the port one needed to sail toward Lorient. The reality of seeing his Leg 8 dreams dashed was sinking in for Telefónica skipper Iker Martínez. “The mood on board is as good as it can be in circumstances like these, as we have just seen any chance of us winning this round the world regatta slip away,” he said. Telefónica led the overall standings in the Volvo Ocean Race 2011-12 for six months — from late November through early June — after surging to an early points lead with off-shore wins in Leg 1, 2 and 3, and multiple in-port race victories. But Groupama’s victory in Leg 4 ended the streak and became part a stretch of five consecutive podium finishes in offshore legs for Groupama that catapulted them past Telefónica in the standings and into first on June 1 in Lisbon.